This is a fine example of the sought after Amel Super Maramu cruiser. This centre-cockpit ketch offers true blue water cruising capability, while being considerately laid out and comfortably sailed by two crew. 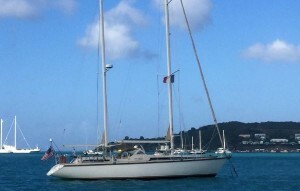 The owners of this Amel Super Maramu have maintained and upgraded her constantly, and she is presented in excellent condition. Features include an upgraded Yanmar 110hp engine, new batteries and battery charger, new soft furnishings, new wool carpets, new dodger/bimini and much more. ‘Anni Bea True’ is well equipped and ready to go cruising with her new owners.